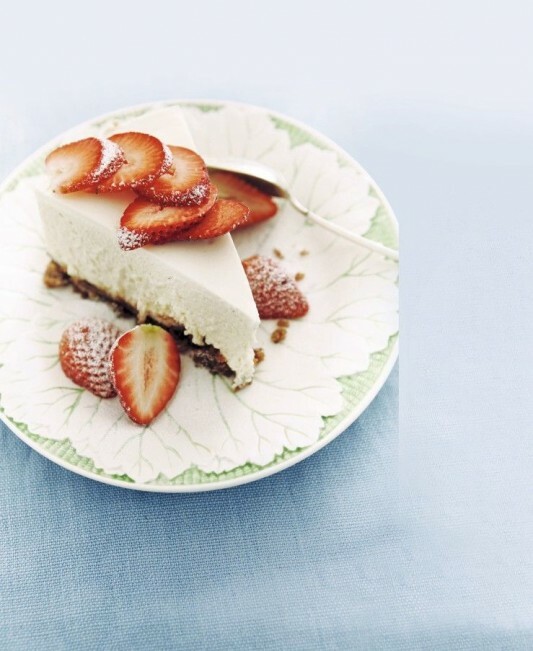 This is my best-ever cheesecake. The cooking time looks short, but this works perfectly, giving you a pale, light and softly set centre. It needs to be chilled well before serving so if you can, make it the day before you want to serve it. This is lovely served as is or with fresh berries or ripe fruit. Grease a 23 cm springform tin and line the base with baking paper. Place the biscuits and melted butter in a food processor and pulse until the mixture comes together. Press the mixture into the base of the tin. Refrigerate for 30 minutes, then bake in a preheated 180C (160C fan-forced) oven for 12 minutes. Allow to cool. Increase the oven temperature to 200C (180C fan-forced). Place the cream cheese, sugar and flour in a bench-top electric mixer and beat until creamy and well combined. Add the eggs and yolk one at a time, and then beat in the sour cream, vanilla, lemon zest and juice. Beat for 2–3 minutes or until the mixture is light and fluffy. Ground pistachios give the cupcakes a lovely pale-green crumb and a sweet, nutty flavour. They are delicious simply dusted with icing sugar, or ice the cakes with lemon icing and decorate with a few extra pistachios. Preheat the oven to 180C (fan forced 160C). Line a 12-hole cupcake tin with paper patty cases. Place the pistachios and caster sugar in a food processor and pulse until ground. Place the butter, caster sugar mixture, lemon zest, flour, eggs and milk into a bowl and beat with an electric mixer for 3-4 minutes, or until just combined. Combine the sifted icing sugar, butter, 1-2 tbsp boiling water and lemon juice. Beat until smooth, adding more water or lemon juice if needed to give a spreadable consistency. Spread over the cupcakes. Decorate with a few extra whole and chopped pistachios, if desired. 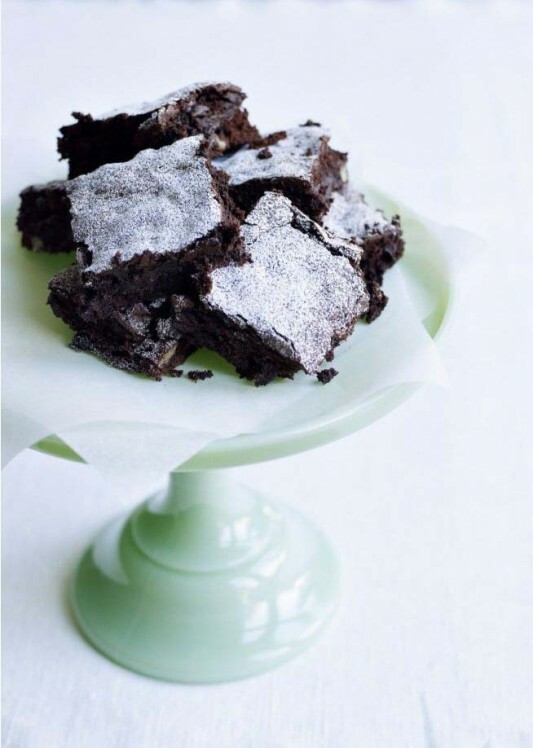 The trick with brownies is not to overcook them – the top should feel firm to the touch, but the centre should still be a little soft when you insert a skewer or toothpick. The chocolate will continue to cook slightly for a few minutes after coming out of the oven. Preheat the oven to 180C (fan forced 160C). Grease a shallow 20 cm x 30 cm baking tin and line with baking paper (leave a little overhanging the two long sides to help remove the brownies from the tin). Melt the chocolate and butter in a bowl set over a saucepan of barely simmering water, stirring occasionally until smooth (make sure the bowl doesn’t touch the water). Allow to cool. Place the eggs, sugar and vanilla in an electric mixer and beat for 3–4 minutes or until pale and fluffy. 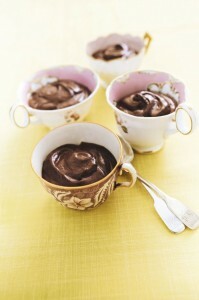 Beat in the cooled chocolate mixture. Sift in the flour, cocoa, baking powder and a pinch of salt and fold in with a large metal spoon until smooth. Gently fold in the chocolate chips.